"A woman lifted up by others is stronger than a woman standing alone!" Part of the mission of Women of Hope is to offer encouragement and support to breast cancer patients. Newly diagnosed patients are facing a new and untraveled road. The journey is often times long and tedious so we want the patient to know that WOH will walk with them through this difficult time and offer support as they enter into this unfamiliar territory. As soon as we are aware that someone has been diagnosed with breast cancer, we present that person with our "pink gift basket", a basket filled with lots of "pink" surprises and a welcome letter to introduce them to the organization. We invite them to join us for our support group meetings so that they might meet other "survivors" who have already traveled the same road. The "sisterhood" is an invaluable resource during the whirlwind of confusion and treatment. A woman lifted up by others is stronger than a woman standing alone! We also provide "pink gift bags" to the Montgomery Cancer Center and to breast surgeons in Montgomery to be given to patients at the time of their diagnoses. This package includes items that the patient might use while taking treatments. 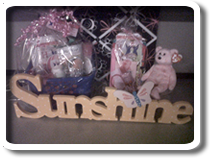 Not only does this gift introduce them to WOH, but it also gives them a warm feeling of encouragement and HOPE. "Pink" will have a special meaning from this day forward! More women (and men) are being diagnosed with breast cancer daily and WOH would like to reach out to those in our community and help make the diagnosis a little more bearable. If you know of someone that has been diagnosed, please call WOH and we will be glad to deliver a basket to them. Every woman has a message to share. Women of Hope would like for you to share your survival story of HOPE. 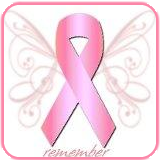 Submit your breast cancer story and yours may be chosen to appear on our web site. Share what you have learned about healing and HOPE. You never know whose life you will impact. By sharing your message, you may just be a light of HOPE for someone facing this difficult journey. There is an amazing blessing in helping others! Your submission should be 150 words or less and may include a link to your email and/or website at the end of your submission. You may also upload a high resolution JPEG photo with your story. Please send submission WITH YOUR PHOTO using our contact form here. We will print as many of the submissions as possible on our website, www.thewomenofhope.org. Thank you for sharing your journey with other survivors!